The final week of the November Gobbler Gaming Giveaway is here, folks! Thanks to NVIDIA, we have already given away three premium Android tablets powered by their Tegra 2 processor to three amazing DL community members. 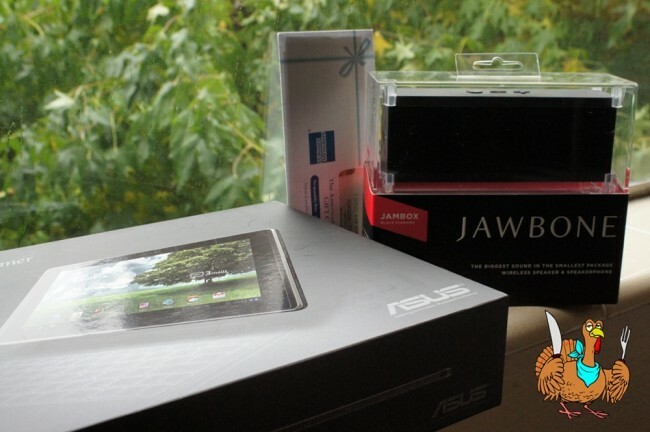 So to go out with a bang, we have one more tablet (Asus Transformer) to give away along with a prize pack that includes a Jawbone Jambox speaker and a $25 giftcard so that you can buy all of the top games from the Tegra Zone. It has been a wild month to say the least, so let’s just jump right into this one and see how many entries we can total. Last week we saw over 3,900 – can we top it? 1. Follow both @droid_life and @NVIDIATegra on Twitter. 3. Like Droid Life on Facebook. 4. In the comments, let us know what piece of technology you are most thankful for. You will have from the time of this posting, through Monday (11/28) at 1PM Pacific to enter. U.S. entries only. One winner will be picked randomly on Monday (11/28) at 2PM and announced shortly thereafter. The winner will be contacted through their choice of entry (Twitter, Facebook or comments). Huge thanks again to NVIDIA for hosting the prizes! Be sure to check out the Tegra Zone for some of the best mobile games you will find anywhere. NVIDIA's Jen-Hsun Huang Expects Tegra 3 Tablets Will Drop To $299 In "A Couple Quarters"